Since WeWork acquired Flatiron School in October 2017, the bootcamp has started taking advantage of the opportunities the new partnership brings. A month after the acquisition, Flatiron School’s online students received complimentary membership to their local WeWork space. Flatiron School also has plans to open a host of campuses at WeWork locations around the country in 2018. The first new campus is taking root in the WeWork White House building in Washington, DC. We asked Flatiron’s Senior Director of Education, Joe Burgess, all about the new D.C. campus, including what instruction, classrooms, and career services will look like. Joining WeWork was a big move for Flatiron School. How is the team feeling? We’re so excited to have joined the WeWork family, and for the opportunities to help even more students — in new ways and in new cities — that come with it! In WeWork we’ve found a partner who is totally aligned with our mission and values, and we are thrilled about their commitment to help us increase access to our education and increase diversity in tech through new programs, scholarships, and more. 2018 will be an exciting year of growth! When does the Flatiron School Washington DC campus open and how is the preparation for that going? March 12th 2018 is the first day of class and applications are open! As the campus gets fully up to speed, we’ll be starting a new cohort of students every 3 weeks. I’m excited for the inaugural DC students to come through this journey with us and help us build this new community together. Hopefully, we can bring the unique qualities of Washington, DC and WeWork into the program, make it super fun and rewarding, and get the same outcomes as we get in New York City. Our launch party was on February 1, and we’ll continue to host lots of events, including info sessions about how to get through our rigorous application process. 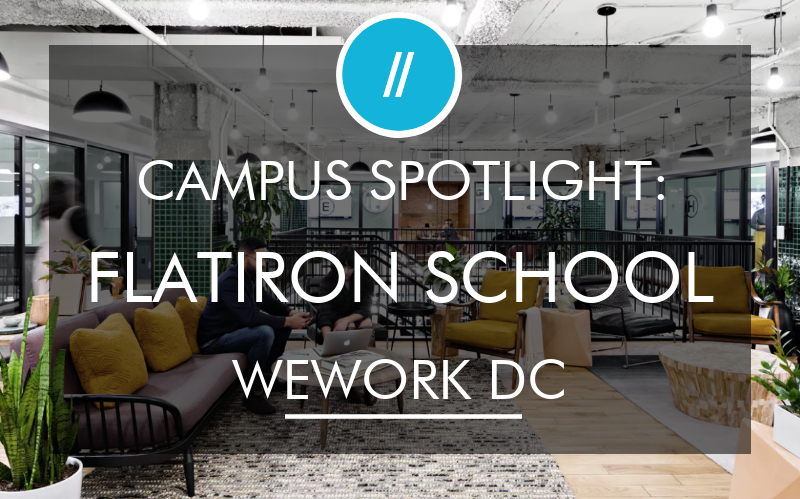 Out of the hundreds of WeWork locations around the US, why did Flatiron School decide to open the first new campus in DC? First, DC is physically near New York, but different enough to New York that it was a challenge. There are a lot of people who are underserved by the current education system. When we looked at the number of open tech jobs in the DC tech, matched with the number of grads in DC, we started to see a divide, in the same way we saw a divide happen in NYC. The tech market in DC is really strong. WeWork also had some space available for us in this beautiful campus, right next to the White House. Why do you think the WeWork White House location is a great space for learning? All WeWork locations are delightful, but I thought there was something magical about our students being able to see the Treasury Building and White House from the classroom – that exemplifies everything unique about DC. The WeWork White House building – where our DC campus is located – is like a triangle, but the middle of the triangle is an open atrium with little balconies with bookable meeting rooms. Finally, ensuring that our campus is easily accessible to our students by being close to public transportation was important for us. Why is the tech market so wide in DC? What is going on in the DC tech scene? There is the obvious reason – more and more government functions are being automated and brought into the 21st century. If you think about the way people interact with most services, they expect an Uber or an AirBnB experience. The government has been contracting with a lot of groups in the city to build out these things for them. Also, with DC inherently being the center of the US, there are a ton of diverse companies that have opened DC offices. And finally, there are a lot of startups. People are starting amazing nonprofits, foundations, and government adjacent work, and want to have a big impact through technology. There are a number of coding bootcamps in DC already – what will make Flatiron School DC stand out amongst the competition? I’m really proud that we put out a third-party audited jobs reports every year. We work our butts off to be as successful as those numbers reveal. 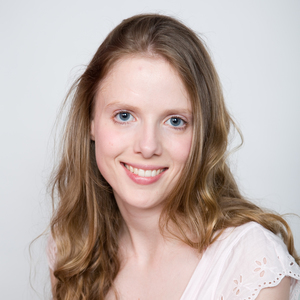 Another aspect is we’ve actually taught and successfully graduated a huge number of students. So we have a lot of experience. We’re not just turning out people who can develop software, but individuals who are prepared to be professionals. We bring speakers from the industry, and we bring in computer science education so our students are well-rounded software engineers. Students work on individual project loads, so they learn to build something from front to back by themselves. Finally, community is so important to us. When you think back to amazing educational experiences, you think about the teachers you learned from and studied alongside. A lot of folks think we are a machine, churning people through, but we’re not. We encourage students to build connections with the folks around you, and by doing that, you’ll work harder, because when the going gets tough, you’ll have friends and a support system. That’s more important than you realize. Will you be teaching the exact same Software Engineering Immersive curriculum in DC like the one in NYC? Who are the instructors and mentors at the DC campus? One of our senior instructors in NYC, Niky Morgan, and a technical coaching fellow, Andrew Cohn, are moving to DC for 3 months, living in WeLive, and helping launch the new campus. In addition, we’ve hired our first permanent teacher. Until recently, he was working as a developer for an AI company, and he also taught our Flatiron high school program a couple of years ago. Tell us about the Flatiron School classroom at WeWork? WeWork has helped us massively, they have completely redone a corner office overlooking the White House to be our campus. They gutted the place, and rebuilt it from scratch to be our classroom. WeWork is custom branding the whole campus for Flatiron. It’s beautiful and exciting! There are two classrooms that can hold about 30 students. All of our classes have maximum 20 students, but we put some buffer in there for people who might be observing. We have five pods of desks which each hold about 20 students. In addition, there is a lounge space and two breakout rooms dedicated to Flatiron School. So if we notice three different people on the same problem, we might go to a breakout room to do a quick review. One of the things we learned from our campus in NYC is no matter how great the desks and monitors are, people like to have different ways to sit and learn, like hanging out on a couch or at kitchen tables. One of the things I like about WeWork is that students will have many different ways to unplug, recharge, and get back to learning. If you can’t figure something out you can go for a walk and work somewhere else and get inspiration. Students can use the WeWork common space as well, and if they have a meeting for a group project, they can grab a meeting room outside of the campus. What sort of amenities and benefits are Flatiron School students entitled to as WeWork members? We have all the amenities WeWork provides like free beer, free coffee, a fridge, and a kitchen. There is also an espresso bar on our floor, with $2 espresso drinks, and an amazing rooftop space overlooking the White House with a view of Washington Monument, the Lincoln Memorial, and all the tourists walking around Pennsylvania Avenue. There are also a bunch of opportunities to take part in WeWork community programming, like lunch and learns and events, almost every evening. We want to make sure our students are not separate but they really are part of that WeWork community in a WeWork space. Our students also get all the discounts of being a WeWork member. There is a whole services store, with a huge number of discounts on different things like gym memberships, and meal delivery services. How will Flatiron School make the most of being in a co-working environment like WeWork? We are working with the Head of Events at WeWork White House to make sure students are invited to the events that are particularly applicable to them. And the WeWork team already puts out a ton of notifications about events coming up. I’m convinced students will go to a lot of great things, both serendipitously, and via WeWork’s internal marketing. In addition, we will host our own events like study groups where anyone can come to the campus, talk to an instructor, and learn. We will also bring in great speakers at our campus, or in the WeWork event space. Our goal is whatever we do, whatever events we host, we will endeavor to include the whole WeWork community. What other companies are located in this particular DC WeWork location, and how will that close proximity be beneficial to Flatiron Students? IBM is there, and they have a huge office, as well as Spotify and Nexus. There are also a lot of foundations, and nonprofits. We have this amazing opportunity for students to meet people and make connections in the building. It’s a cross-pollination of ideas, where students can connect their experiences with their learning. Students will have the opportunity to constantly get reminded of projects they are working on now, and connect to work they’ll be doing as professionals. We bring those examples in as teachers, but it’s better if it comes from other companies. The original point of a university was to bring together disparate minds to discuss ideas, so this is similar in a way, where people are learning, researching, and meeting people from all walks of life. Do you envision that Flatiron Students will find jobs within the WeWork community? That’s the hope. I would not be surprised if this year someone started working at one of the WeWork member companies. They could effectively do a 15-week interview process, plus there is a WeWork jobs board with freelance gigs and other opportunities. Flatiron School is not slowing down on career services efforts – DC students will get just as good, if not better, support from our career services team. We are obsessed with student outcomes, so it’s important that students understand we are going to help them as much as we can. But we also need students to take it upon themselves to meet other companies in the building, and to realize what an amazing opportunity it is. If students aren’t working at it, they won’t be successful. In addition to being hired by WeWork member companies, what other types of jobs do you expect students to get in DC? We’ve had a few grads from our other programs find jobs in DC already – one of them, Jim Stricker who works at Excella Consulting, is going to speak at an event soon. We train our students to get junior software engineering jobs, so I trust our students can get those jobs. The truth is, there are some jobs out there called “software engineer,” but really a junior person could do them. Potential jobs include working on a software project for a large government contractor in Java, to working for a super small startup. We try not to focus students on one industry or technology. We want grads to be general purpose, internet swiss army knives, who can do anything you ask them to do so that they have largest choice when they graduate. WeWork is a different scene than the Flatiron School that we know in NYC – is there anything you’re concerned about losing in this new campus? Very rarely are culture changes negative; they are usually additive. WeWork has always had a culture of personal expansion and personal growth. Their understanding of seeing how you can grow talent, rather than looking for degrees and checkboxes, dovetails very nicely with our philosophy that anyone can learn to code. So I really believe it’s additive to our culture. Every time I’ve talked to a WeWork employee about Flatiron School, they’ve been over the moon excited to have us. I’m excited to get some of that WeWork culture and ambition, and imbue some of our own culture of constant learning, and the bright eyedness of students, into WeWork itself and into the WeWork community. What are the future plans for this Flatiron and WeWork partnership? We are going to open campuses in a bunch of other WeWork locations in 2018 – you’ll hear more about them soon. We are probably going to outgrow our New York City space soon, and we are figuring something out. We love our campus, so I’d be surprised if we move soon. Currently, all of our online Learn students have WeWork global access membership, so they can work in the common space at any WeWork. We have this amazing opportunity where WeWork can provide the space and the community, and we can provide education at scale via online and in-person delivery methods. We can provide more flexible and accountable ways for students to learn. For a lot of people it’s not all online, for other people, it’s not all in person, there needs to be some space in between. By the end of 2018, you will see an amazing new product that fills that space. We are also providing a mini bootcamp for WeWork employees, we’ve actually already done a bunch of one-night workshops for them. Our goal is to provide access to our education to WeWork employees and members at a good rate.